During a professional facial, the facial mask is applied after cleansing, skin analysis, exfoliation, extractions, and massage. Facial masks treat your particular skin type or condition, whether it's dry, dehydrated, sensitive, red, or oily. Facial masks generally stay on your skin for 10 to 15 minutes and contain ingredients like clay, black moor mud, aloe vera, seaweed, algae, essential oils, massage oils, herbs, and vitamins. After the mask has done its work, the esthetician removes it and completes the facial with an application of toner, serum, moisturizer, eye cream, lip balm, and if it's day-time, sunscreen. One sign of a good facial is when the esthetician stays in the room with you during the facial mask, giving you a scalp massage or some other service that enhances your experience. However, whether you prefer to do it in the salon or make your own facial mask at home, getting a facial mask can go a long way to improving the overall health of your skin. A face mask is intended to treat your particular skin condition, so it's important to choose the right one for you. If you're using a professional skin care line, your esthetician can usually recommend a facial mask for you to use at home, but some are only available for professional use. Depending on their ingredients, masks can tighten and tone, hydrate, nourish, draw out impurities, help blemishes heal, calm and soothe, or rejuvenate the skin—or any combination thereof. Additionally, there are several types of masks including clay, cream, setting, and gel varieties, each of which offers its own unique benefits. Clay masks, which contain clay, kaolin, or bentonite for their tightening and sebum-absorbing effects, help draw oil and dirt to the surface of the skin. Meanwhile, cream masks or gel masks are formulated to hydrate and nourish the skin. On the other hand, setting masks harden into a rubbery state before the esthetician peels them off. The benefit of going to the spa or salon for these treatments is that you can talk through each product with your esthetician before you commit to one. Additionally, licensed massage therapists and experienced estheticians know plenty of tricks to help reduce the pain associated with some of these procedures. 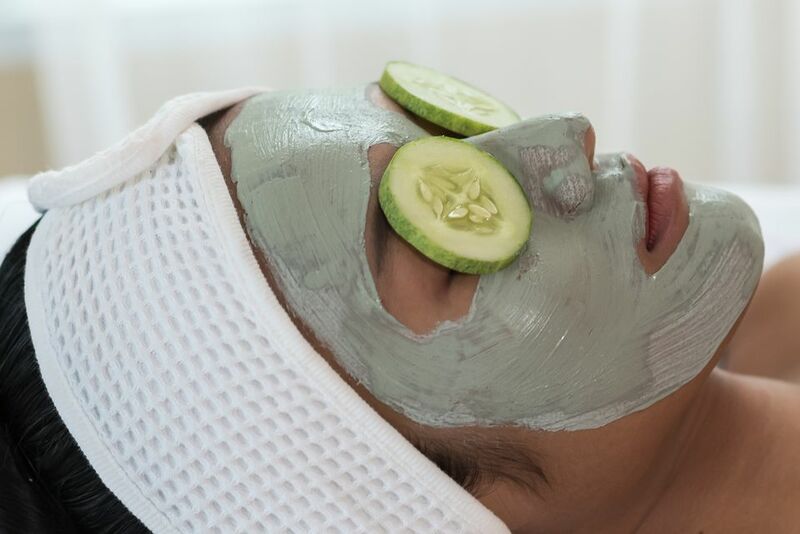 While it's recommended that you go to a professional esthetician for a fully curated and personally tailored facial mask, there are plenty of over-the-counter masks and at-home creations that can go a long way to restoring your skin without the price tag of a fancy spa or resort. Fresh fruits, vegetables, milk, yogurt, honey, and eggs have been used for centuries as home beauty remedies. Although these ingredients are fun to experiment with yourself, you won't find them in a spa setting because of convenience and sanitation, but knowing the effects of each at-home solution can be difficult, especially if you're trying to achieve specific results. Cucumbers provide cooling, soothing, and healing effects, especially when placed over the eyes or mixed in a blender with other ingredients. Avocados are rich in vitamins A, B1, B2, D, and E and oil, which makes it a good choice for restoring moisture and toughening dry and sensitive skin. Honey has hydrating, toning, and tightening effects, and is often mixed with other ingredients for combined effects. Papaya contains papain, a protein-digesting enzyme that dissolves the dead outer layer of the skin, which means you should avoid using this mask if your skin is already irritated or sunburned. Egg whites tighten and tone the skin. Yogurt contains natural lactic acid that helps exfoliate the skin and can be used alone as a skin softening face mask, which is appropriate for all skin types. Potatoes thinly sliced can be used for oily skin or to reduce under-eye puffiness. Herbs and teas such as chamomile (soothing) can be used as ingredients for face masks to add a variety of effects, depending on the plant. Making a face mask at home is relatively simple—just blend ingredients together until you have a thick enough paste to smear on your skin. Depending on your desired outcome and the effects of your ingredients, you should be able to feel results as soon as you wash off your face.